On 29 May 2012, a friend of mine on Facebook shared a compelling and somewhat disturbing video that drew my attention to a recent BBC Panorama programme about racism and anti-semitism in football stadiums in Poland and Ukraine. The programme puts the spotlight on football fans with "a reputation for violence and racism" in Poland and Ukraine - many of whom glorify Nazism, anti-semitism and racism by making Nazi salutes on the terraces, taunting black players with monkey chants, chanting anti-semitic slogans and attacking foreign fans during football matches. The programme is particularly disturbing because the two countries - Poland and Ukraine - are poised to co-host the Euro 2012 championship. The Panorama programme, Euro 2012: Stadiums of Hate, reveals evidence of racism, fascism, xenophobia and anti-semitism in Poland and Ukraine, and raises questions whether UEFA - the organizer of Euro 2012 - chose the right hosts. The programme is hard to watch and some viewers may find it disturbing. Blatant racism and anti-semitism in stadiums in Poland and Ukraine is outrageous. Even more outrageous is the impunity enjoyed by violent and racist fans. Law enforcement officers are either unable or unwilling to protect targeted ethnic and religious minorities. Some viewers of the documentary have argued that it's biased. Others say it's a manipulation and a smear campaign against Poland and Ukriane - the co-hosts of Euro 2012. However, the video report speaks for itself. Racism and anti-semitism are ugly realities in Polish and Ukrainian football, and there is evidence to show that these social ills go beyond football in these societies and haunt ethnic and religious minorities in everyday life. This piece of investigative journalism simply shines light on an existing problem. It's worth highlighting at this point that racist violence is not uncommon in Ukraine. 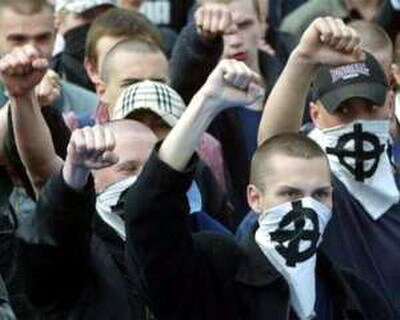 Violent attacks on individuals in Ukraine are well-documented. All eyes will be on Poland and Ukraine during the UEFA Euro 2012 championship, which starts on 8 June 2012. Any racist or anti-semitic attack or chants during the tournament would be an embarrassment for UEFA and a setback for civilization in Poland, Ukraine and Europe in general. *Photo: Kiev Ukraine News Blog.